We are instrumental in manufacturing and exporting a wide range of Zinc Metallizing Wire. These products are used for Spray Metallization in Capacitors, Anti-Corrosion Protection and Filming Industry. For Zinc Wires, Our infrastructure- Evolved from a conventional Zinc Wire plant, has today acquired the distinction of being the first and only zinc wire manufacturer in Asia to have ‘CONTINUUS PROPERZI’ i.e. a Continuous Casting and Rolling Line. Our Zinc Wire manufacturing plant is equipped with 1200 MT/ Month Production Capacity to cater the requirement of our Customers. Our product range is available in various Sizes from Dia 4.00 mm To Dia 1.60 mm. with tolerance of + 0.00 mm & - 0.05 mm. For the manufacturing of these products, we use only high-quality virgin metal i.e. special high-grade zinc having purity 99.995%. Adherence to our stringent Quality Control system ensures the best quality of our products. 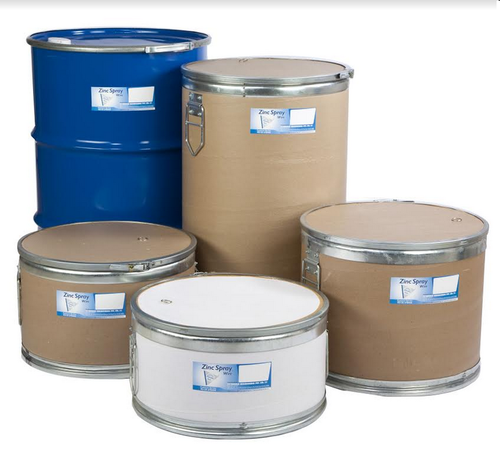 Endless Drum:- 450 Kg Metal Drum, Paper Fiber Drum of 70-100 kg & 250 kg.Coils: Coils weigh 30 or 35 kg, Protected against uncoiling with Polyethene Bands & Goni Pack.Spools: Wire coiled on plastic spools of 3 Kg & 15 Kg each Protected with Polyethene and put into Cardboard Boxes. Evolved on German collaboration, today Khosla Engineering Pvt. Ltd. is a self-reliant unit, in tune with advanced solder technology and backed by an in-house R&D division. At Khosla’s, the plant is a mechanically operated extrusion and wire drawing system which is a continuous process, where tons of solder wire are extruded without break. Quality is the bedrock of our business. The use of Khosla Solder in the ASLV Satellite bears testimony to this. Also, we are approved and registered by DGS&O, New Delhi. Khosla is the name in Zinc Spray Wire too. In 2000 we expanded our product portfolio to include Spray Metallization Wires, and continuing with our cherished tradition of making consistent quality products adhering to the highest standards, we have emerged as a major manufacturer of Zinc Spray Wire in India. For Zinc Wires, our infrastructure- evolved from a conventional Zinc Wire Plant, has today acquired the distinction of being the first and only zinc wire manufacturer in Asia to have ‘Continuus Properzi’ i.e. a Continuous Casting and Rolling Line. Our zinc wire manufacturing plant is equipped with 1000mt/ every stage of production is subject to stringent Quality Control in our well equipped laboratory. We have a proven Quality Control Plan for all our products backed by ISO 9001:2001 Quality System in our company, certified by DNV. Khosla’s high performance products are widely accepted in diverse industry segments. We are the sole supplier for the Ductile Iron Pipe industry in India, successfully meeting their growing demand for Zinc Spray Metallization Wire. All the leading Capacitor manufacturers also rely on Khosla Zinc Spray Wire and Khosla Solder Wire. Khosla also spells convenience for PCB Assemblers. By supplying Solder Wire, Sticks and Flux under roof, we maximize the convenience in PCB soldering. Specifically, we offer Special Solders for Electronic Industries. We are also the one-stop supplier for Capacitor makers; our bouquet of materials here includes Urea Core Solder Wire, Zinc Spray Metallization Wire and Solder Sticks (Tin/Lead), all confirming to IS norms. We believe in leadership through excellence. Our inspired journey of 46 years is marked by many proud milestones. As we move ahead towards an exciting future, we pledge to create new benchmarks that will lead to greater customer satisfaction.